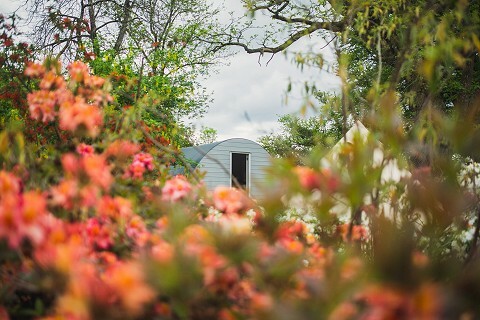 Glamping at Ballyvolane is not only glamorous but also a luxurious and romantic way to experience the magic of nature without forgoing your creature comforts! Glamp in the garden from May to September. Our 4-metre bell tents are designed to accommodate 2 people while our 5-metre tents comfortably sleep 2 adults + 2 children. The Glamping Ark, modelled on the traditional pig ark but a lot comfier(! ), also sleeps 2. Ballyvolane Glamping is a fully-catered, fully serviced glamping experience and all meals, drinks and afternoon tea provided in the main house, so our glamping guests can fully immerse themselves in the Ballyvolane House experience. It’s not a ‘cook-your-own’ meals type of glamping operation but if you’d like to eat out, we’re always happy to recommend some great restaurants nearby. Our ‘Glampers’ are given a ‘glamping box’ on arrival containing essentials such as matches, water, local Crinnaughtaun Apple juice, a jar of homemade chocolate cookies, maps of the estate, a torch and head-lamps. Free Wi-Fi is available in the main house. The bell tents & the Pig Ark are fully kitted out with raised timber beds decked with comfy mattresses made by the Natural Mat Company. The mattresses are stuffed with recycled jeans and organic lamb’s wool and covered with washable cotton ticking. The beds are made-up with proper cotton sheets, pillows, duvets and blankets. Towels are provided. A tea-light chandelier hangs from the centre pole to provide light and the tents are furnished with bed-side tables, chairs and coir carpet. You can actually stand upright inside the tents, and best of all are the hot water bottles you’ll find in your beds, put there during evening turn-down service. Full Irish breakfast is served till noon in the main house. A fully heated wash house containing loos and showers is located adjacent to the Glamping area, and is furnished with mirrors, good lighting, clothes-hooks and we have hair-dryers. We promise a fantastic and warm night’s sleep in a stunning, quiet, country house garden setting. This is camping at it’s best. Please note ‘check-in’ time is 3pm and ‘check-out’ time is 12noon. To book, please phone us on 025 36349, send us an email or get in touch here.